Andrew Yeh of KBOO-FM, Portland program, APA Compass interviewed me in May about how I became interested in writing about Chinese American history. The recent Pew Center Report, The Rise of Asian Americans, includes an interactive census map that gives the number of Asian Americans in each county in the U. S. For example, the above map shows there is 1 Chinese out of 16 Asian Americans in Graham County, KS. (pop.2597). Review of "Sweet and Sour" by Raymond Lum of Harvard University in April 10, 2012 issue of China Insights. A "Sweet" Review of "Sweet and Sour"
Flavor and Fortune, Jacqueline Newman's authoritative but readable quarterly journal on cultural, nutritional, and gastronomical aspects of Chinese food, gave a nice review of my book, Sweet and Sour. on Chinese family restaurant history. A variant of a talk about my adventures after retiring from college teaching in writing and speaking about Chinese American history that I first presented in April at California State University, Long Beach. 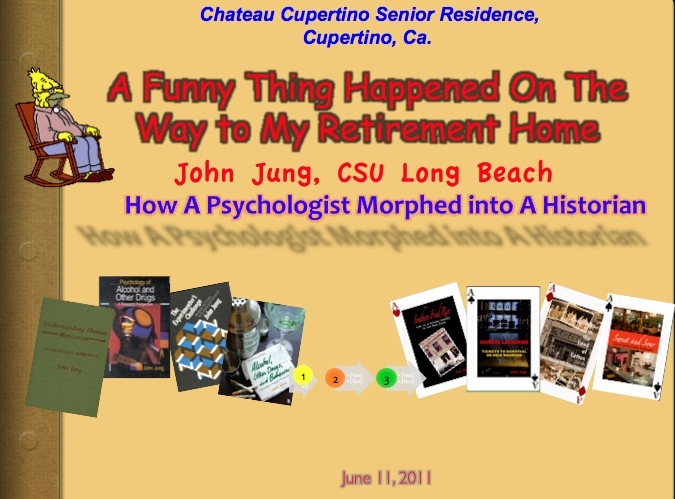 My audience consisted primarily of college students, and some former colleagues not yet retired, in the Department of Psychology. It played well, and served to tell students that they don't have a corner on the life of the mind, and not to dismiss us retirees as 'over the hill' intellectually.Speaking at Chateau Cupertino (just down the street from a well-known computer company), I faced an audience at the opposite end of the age span, some even older than I, and all in some stage of retirement. I gave essentially the same talk, but the implicit message was different. For some of them, the message was "it's never too late!" That is, using your life experiences and wisdom, you might have some meaningful things to write about that you could share with others. This was an opportunity for me to present a different kind of talk about "Sweet and Sour,' and the social history of Chinese family restaurants at a different type of venue and audience. My past audiences for this book have consisted of Chinese who had some direct experience with Chinese restaurants and Chinese interested in the historical development of this business among Chinese. Now I was with an audience of mostly non-Chinese, and people, for the most part interested in culinary matters. A leading foodie bookstore provided a lovely and intimate setting for the presentation, which unlike other talks where I could use visual images to enhance my points, was completely devoid of slides, photos, and other graphics. This required establishing good rapport and constant eye contact to engage the audience. Having the talented poet, Nellie Wong, recite the restaurant poems that she contributed to the book was a special component that captivated the audience. Overall, the evening was very successful and Nellie and I joined several members of the Culinary Historians for dinner, where else, but a nearby Chinese restaurant. Chinese Translations of Yin & Yang Books? About a year ago, a Taiwanese attending my Houston talk on Mississippi Chinese grocers suggested that I have my books translated into Chinese. He felt that in China many people would be interested in what life was like for those who immigrated to Gold Mountain, or Mei Guo. However, someone else disagreed and maintained that Chinese in China would be disinterested. In any case, I didn't have a translator and the cost may far exceed the sales. Furthermore, I'd have no experience in setting up marketing and distribution arrangements in China. Others warned that my work would be pirated. So much for translations! In Chicago where I was giving a talk about "Sweet and Sour," I was asked if I would be agreeable to a 'sight translation' where the translator would record an "audio book" in essence so that Chinese who did not know English could listen to my books. The translation would be free, and the audio broadcasts would also be free to the listener. The idea sounds promising and would help expose my books to a much wider audience. As if that wasn't exciting enough, the next day I received an e-mail from a Chinese writer who was living in, of all places, my hometown of Macon, Georgia! She had discovered "Southern Fried Rice.' my memoir of our family's life in Macon back in the era of rigid Jim Crow rules of segregation, and wanted to explore the prospects of publishing translations of my books in China and Taiwan. It is too soon to tell exactly what will come from these offers, both coming right out of the blue. But I am hopeful that eventually my work will get translated and become available in Chinese. There has to be some interest in China, as the National Library of China in Beijing does have a copy of Southern Fried Rice and the University of Hong Kong has copies of all four of my titles... but only the English versions!